On Twitter in November 2018, Rabbi Danya Ruttenberg posted a tweet detailing the varieties of what inclusion looks like in her context. 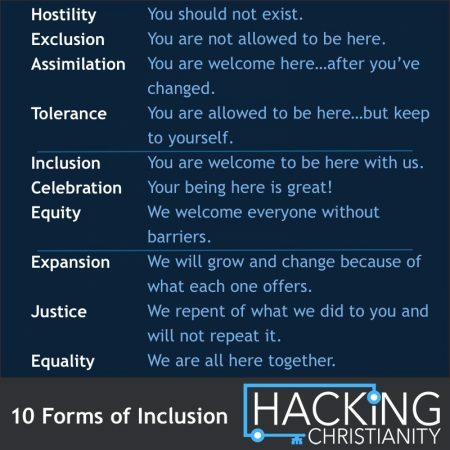 With acknowledgment to her inspiration, here’s an expansion of that tweet into the ten stages of inclusion, detailing the nuances between inclusion and exclusion. Note: I am using the terms “dominant group” and “minority group” as general terms that can be applied to any people group or perspective group. Indeed, the better term is “minoritized populations” since people groups can be treated as minorities even if they are not actually the minority (they just don’t hold the keys that the dominant group does). These general terms are used with acknowledgement to their limitations. The following details what each stage of the graphic means to the relationship between a dominant group and a minority group in the same context, community, or society. Hostility – You should not exist. The dominant group seeks to do harm to or deny the personhood of a minority group. Exclusion – You are not welcome here. The dominant group considers a minority group as inconsequential. Assimilation – You are welcome here…after you’ve changed. Only after the minority group has met dominant group expectations will they be welcomed. Tolerance – You are allowed to be here…but keep to yourself. The dominant group will not interact with the minority group. Inclusion – You are welcome to be here with us. Neither the dominant group or the minority group are forced to change. Celebration – Your being here is great! The dominant group actively names how great it is that the minority group is here. It is as easy for the minority group to be here as anyone in the dominant group. Expansion – We will grow and change because of what each one offers. The dominant group and minority group appreciate each other and change in mutual ways. Justice – We repent of what we did to you and will not repeat it. The dominant group makes right the past harm, seeks humility in the present relationships, and agrees to new norms that discourage future harm. Equality – We are all here together. There is no dominant group. We reciprocally value one another and accept an equal amount of discomfort and comfort. Many churches market themselves as “inclusive” of LGBTQ persons, but what does that mean? LGBTQ persons can be tolerated in conservative Christian spaces, though their perspective and relationships are not acknowledged. LGBTQ persons can be welcomed after they’ve undergone conversion therapy or chosen celibacy (assimilated). LGBTQ persons can experience inclusion into a straight monoculture church. LGBTQ persons can be named and celebrated as valuable members of a church. A church can repent of the harm done to LGBTQ persons, ask their forgiveness, and set in their polity to never discriminate on the basis of sexual orientation or gender identity again (justice). 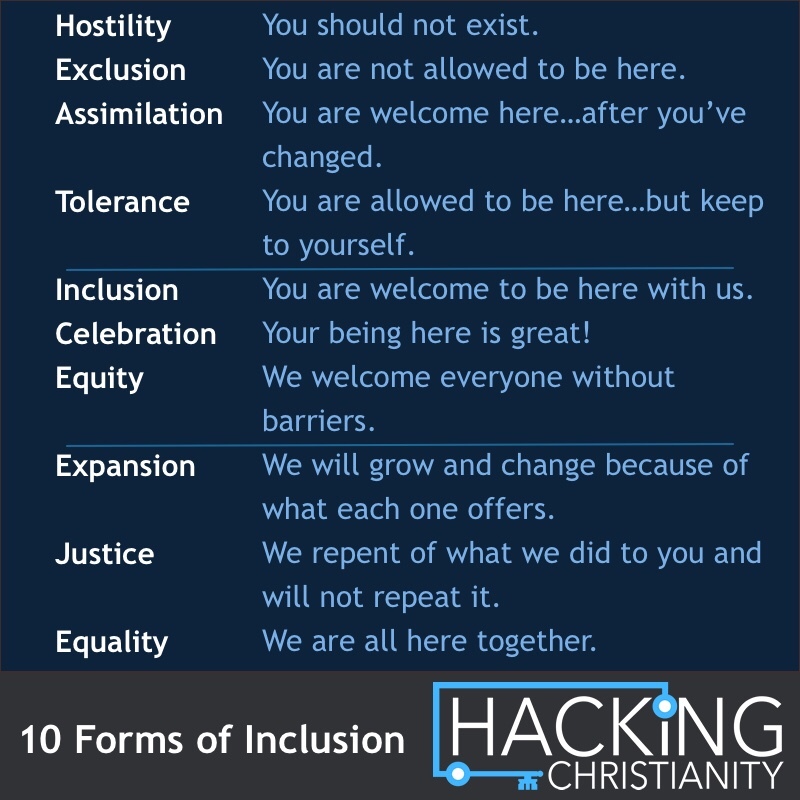 Just because a church markets itself as “inclusive” may not mean what you think it means. Thanks for reading, commenting, and sharing this post on social media. You are appreciated! It’s important to mention that only people in the minority group get to determine how successfully the majority is practicing inclusion. Intention is not enough and it should go without saying that people will have varying experiences and goals. I also think it’s important to say that it’s the majority’s job to ask for feedback from those in the minority in safe, non-stigmatizing ways.